Here is a preview of my latest pair of stays. 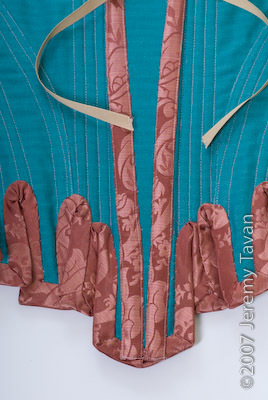 The pattern is not directly based on any one corset but from merging some modern patterns of my own corsets with images in Corsets and Crinolines for 17th and 18th century corsets. I adapted it until I had a unique pattern that I loved on myself. 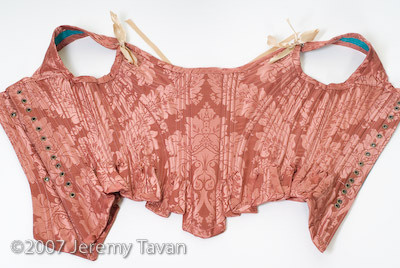 I’m going to adapt the pattern to create more accurate 18th century details for my personal wedding corset. I chose to pattern match all pieces focusing at the waist-point except at the back where I centered the design on the back panels. 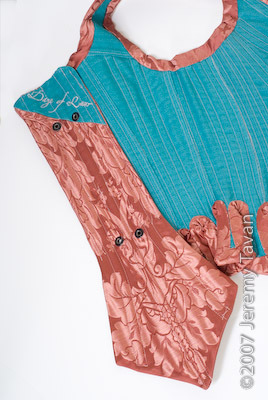 This is the first corset where I’ve added a tail to the backpanel that flares out. Pattered with a two inch gap, a backpanel with grommets for the spiral lacing to pass through, and an optional wooden busk that ties in place. Are they not showing up? A phootshoot will be planned for the corset on my body in the upcoming weeks, so check back.